Health, wellness & wholeness is a lifelong process. It is understanding & integrating many sides of yourself, leading to a deep connection with inner wisdom & finding balance (Dossey, 2013). Health Coaching with a Registered Nurse encourages you to explore all 8 components of humanness, nurturing each one & discovering what it means to honor your version of health and connect to who you are (click each one to learn more): (1) Life Balance & Satisfaction, (2) Relationships, (3) Spiritual, (4) Mental, (5) Physical (Nutrition, Exercise, Weight Management), (7) Environmental, & (8) Health Responsibility (International Nurse Coach Association, 2014). Nurse Coaches focus on your strengths, instead of focusing on problem areas, and help you learn how to be fully present in your unique self. Your life journey is constantly evolving, as is your body, mind, spirit, culture & environment. Cultivating all areas of health, wellness & wholeness keeps you aware & fully alive. At different stages of life your definition of 'healthy' & 'whole' will vary. Discovering what that vision looks & feels like, & then learning strategies to flourish through all moments of life, will help you find health, wellness & wholeness; for even in illness, there can be health. 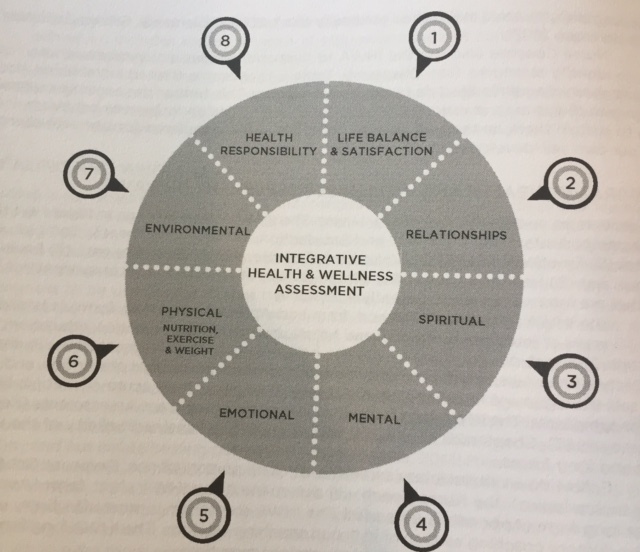 The International Nurse Coach Association's Integrative Heath & Wellness Assessment is based on over 30 years of integrative, integral, & holistic nursing clinical practice, education & research & aids in the process of self discovery. It guides you towards self discovery, & your ultimate health, wellness & wholeness.